The stone circle was revealed to be a modern replica. An ancient stone circle that has remained unknown to archaeologists for thousands of years has been officially recognised. 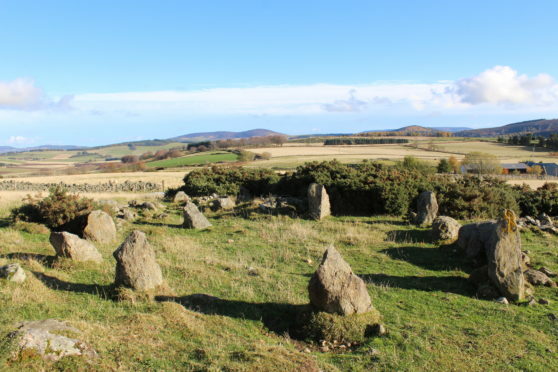 The complete stone circle is located on a farm in Leochel-Cushnie, not far from Alford, and was reported to Aberdeenshire Council’s archaeology service by Fiona Bain, whose family have farmed the land for generations. The recumbent circle – which consists of 10 stones – has been known to farmers for years but until now had not been recorded by any official organisations. This type of formation is unique to the north-east and dates back between 3,500-4,500 years. However, this specific circle is about 10ft smaller than other formations of this kind so has been an unusual find for archaeologists. Neil Ackerman, historic environment record assistant at Aberdeenshire Council, visited the site along with Adam Welfare, Alison McCaig and Katrina Gilmour from Historic Environment Scotland. Mr Ackerman added: “This amazing new site adds to our knowledge of these unique monuments and of the prehistoric archaeology of the area. “It is rare for these sites to go unidentified for so long, especially in such a good condition. The defining feature of these types of circles are a large horizontal stone, the recumbent, flanked by two upright stones, usually situated between the south-east to south-west of the circle. Moira Ingleby, chairwoman of the Marr area committee, said: “This newly recorded site highlights the internationally important archaeology we have within Aberdeenshire. “Adding it to the record of known archaeological sites will add to the understanding of these fantastic monuments that are unique to the area.